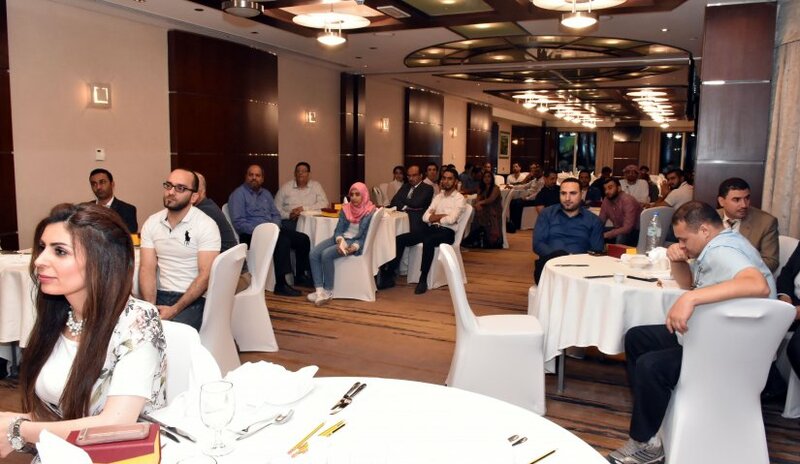 In the presence of the Chancellor, Dr. Noor Aldeen Atatreh, Vice President for Academic Affairs, Dr. Sameer Barghouti, College Deans, Heads of Departments and academic and administrative staff, AFU members gathered last week to commemorate Iftar. Dr. Atatreh congratulated everyone on the month of Ramadan and wished them success. He commended the organization for such events set to renew the spirit of harmony, friendship, and promote social interaction among all the staff of the university as a family. He also stressed the keenness of the institution to renew communication and to instill affection and brotherhood during the Holy month. He also pointed out the importance of every employee’s role in the university in order to continue the path to success. He expressed his support to all the members of the Al Falah family through words of encouragement. Dr. Samer Abdel Hadi, Assistant Professor from College of Mass Communication honored Dr. Atatreh, with a commemorative gift for his efforts in the course of the educational process at the University together with the other faculty members and administrative staff. Ms. Ghaida Rawashdeh, Head of General Education Department together with Ms. Aysha Ehsan, organized several games much to the delight of all participants.